Mayor Bill de Blasio has signed a package of three bills designed to improve working conditions in private carting, and move towards ridding the industry of fake sham unions. 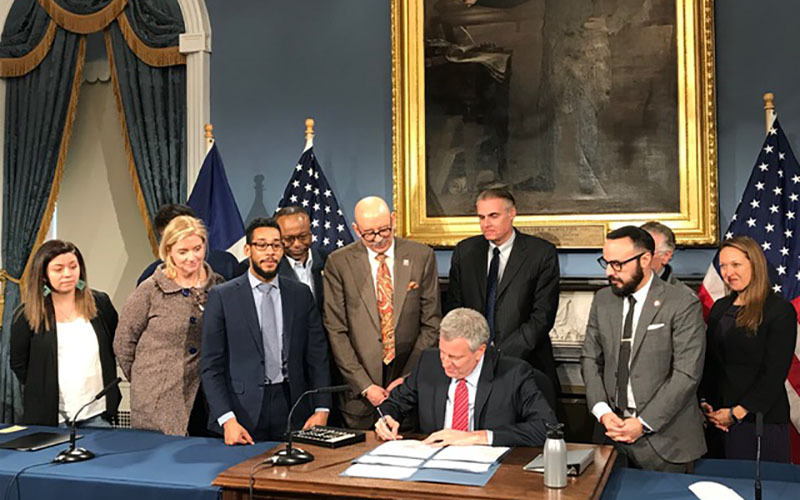 “This was a very good day for reforms in private carting, and a first step towards the historic reforms we anticipate seeing passed with commercial waste zones later this year,” said NYLPI Senior Staff Attorney Melissa Iachan, pictured with the mayor at the signing, above, on the right. As NYLPI has previously said, these bills represent a real response to what private sanitation workers have been reporting for years—that fake, sham unions have cropped up throughout the waste industry, allowing some of the most notorious employers to continue to work with individuals who have been banned from the industry for links to organized crime. These bills close a loophole in BIC’s authority to rid the industry of corruption, and hopefully represent the first step in raising labor standards in what has been a race-to-the-bottom industry. Along with our partners in the Transform Don’t Trash coalition, NYLPI was instrumental in drafting the labor anti corruption bill, and in advocating to get all three passed. You can read more about the bills from our press conference announcing them in January, here.